A Norfolk Southern train derailed around 9:00 Friday night, Apr. 10, 2015 near Salters Pond Road and Hwy 121 in Trenton. 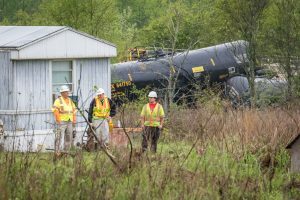 Early reports are that several train cars overturned, and The Advertiser was able to confirm there was a chemical spill at the site. Just what type of chemical was spilled was not yet known. Residents within a 1 ½ mile radius are being evacuated to Mt. Canaan Church due to the unknown chemical spill. Edgefield County Sheriff’s Office is blocking the roadway leading to the site. The Advertiser will continue to follow this developing story and report more details as they become available. Suzy Spurgeon, Deputy Director of Edgefield County Emergency Management, states that 39 cars, including two locomotives, derailed after hitting a downed tree. There were no serious injuries to the train’s engineers, as the locomotives remained upright. The tree is believed to have fallen naturally after yesterday’s thunderstorms. There was no chemical spill. It is hoped that will remain the case as the derailed cars are uprighted. Currently, only residents of Salters Pond Road are evacuated. Residents near the site are being allowed to return to their homes to retrieve essential items. They are expected to be dislocated for two to three days as crews upright the derailed cars and clear the scene. 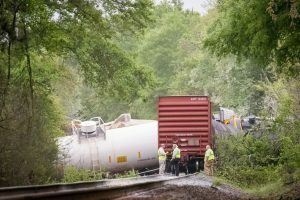 Edgefield County EMA Director Suzy Spurgeon spoke with The Advertiser Saturday afternoon and confirmed that one of the derailed train cars did rupture in the crash and spilled ammonia nitrate (dry fertilizer) at the scene. However, officials are not concerned with this spill as it is fertilizer. The spill happened among an area that Spurgeon described as “rugged” with a lot of underbrush. While an effort will be made to clean up this spill, it is not believed 100% of the fertilizer will be removed. Spurgeon said cars in the derailment were carrying “several things” but the biggest concern was anhydrous ammonia that was carried in one of the cars. According to the Centers for Disease Control and Prevention’s (CDC) website, anhydrous ammonia is a colorless gas with pungent, suffocating fumes. It is used as an agricultural fertilizer and industrial refrigerant. The CDCs site stated that if handled improperly, anhydrous ammonia can immediately be dangerous to life and health as it expands rapidly when exposed to air into a large cloud that initially hugs the ground. Exposure to this gas at high concentrations can be fatal. Fortunately, the derailment did not cause any spillage of this gas. Spurgeon said that at this time only one family is still displaced as a result of the derailment; that family’s home being nearest the site. The displaced family has been asked to stay away from the site for at least another 24 hours as there is a small amount of danger as the cars are up-righted and moved. Families affected by the crash have been given a claim number in which they may contact Norfolk Southern. The Edgefield County Sheriff’s Office has secured the scene, and Norfolk Southern is in charge of the cleanup efforts. However, they have contracted out some of the cleanup work. The Department of Health and Environmental Control (DHEC) as well as the Environmental Protection Agency (EPA) are at the site and are monitoring the situation. Spurgeon said that a complete cleanup of the site is expected to take a week or more. Emergency responders in the yard of Kim and Joni Outlaw at the scene of the April 10, 2015 derailment of a Norfolk Southern freight train near Salters Pond Road in Trenton, S.C. Scene of April 10, 2015 derailment of Norfolk Southern freight train near Salters Pond Road in Trenton, S.C.